The new TPC Series devices are high-frequency induction generators with an integrated heating temperature control system and an advanced I/O interface. The generators are extremely compact, and combine high levels of stability and repeatability of the power delivered with the speed, accuracy and precision of the temperature control system. The very fast response time of the Integrated Controller (=0.5 ms), in combination with the accuracy of CEIA SH15/SLE Pyrometers, allows a very precise and sharp temperature control. 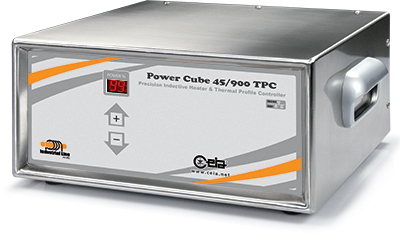 The Power Cube TPC series induction generators are strongly orientated towards integrators and OEM customers. The heart of the device is an extremely compact generator with solid-state technology and state-of-the-art electronics, entirely controlled via microcomputer. This allows operation at maximum efficiency whatever the conditions of the work load, maintaining precise, stable and repeatable power delivery. The generator powers up to two miniaturized induction heads, which can therefore be positioned easily in restricted spaces and are also easy to mount on robots and automatic machinery. An original, patented energy transfer solution allows rapid heating of metal components with the minimum absorption of power from the supply network. 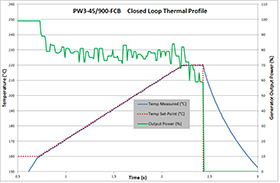 The Power Cube TPC allows operation in thermal profile mode. All the operational parameters of each phase of the heating cycle can be programmed, allowing maximum flexibility in the setting of the heating times, power delivered and operational temperatures for the piece to be heated. The Field Bus and RS-232 interfaces, in addition to digital and analogical I/O signals, allow connection to a PLC or other external logic for activation, inhibition, control of the power delivered, the operational status of the generator and any excursion from the threshold of the thermal profile set. Complies with EC Regulations and International Standards relating to Electrical Safety and Electromagnetic Compatibility. Complies with 2004/108/CE regulation for industrial applications.